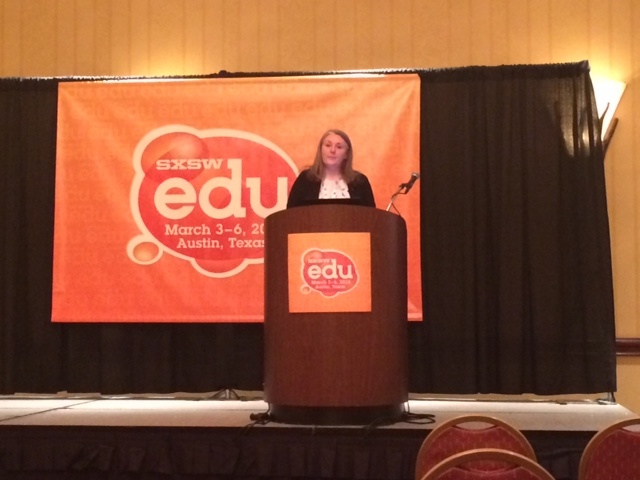 Erynn Peterson, co-founder of Station082 speaks at SXSWEdu in Austin. Austin, TX — Wanted: Innovators who embrace technology start-ups, relish weekday happy hours and enjoy expert education commentary from newly minted CEO’s. Enthusiasm for “disrupting,’’ a plus. Stamina for “wall-to-wall,” creativity, and “transformational ideas’’ helpful, especially on topics like MOOCS, Big Data, micro-credentialing and virtual reality. Yup, it’s time for my third visit to the sprawling, bursting-with-energy six-year-old South by Southwest.edu conference in Austin this week. My inbox is overflowing with party invitations, panel promotions, survival tips and requests for one-on-one interviews. For a journalist, it’s easy to be overwhelmed, and even more tempting to be skeptical and somewhat snarky. Related: Is SxSWedu a tech conference in educator clothing? 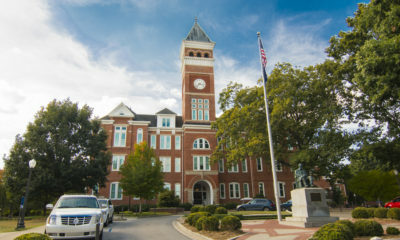 After all, this four-day festival has everything from “impactful conversations” to morning mixers and a hands-on playground. It’s possible to spend the entire time attending meet-ups, watching films, networking, partying and socializing. So, is this festival really an opportunity to learn about education? At any rate, there’s an endless variety of “learning’’ sessions. Bet you had no idea there were so many new ways of learning. Adaptive learning. Blended learning. Innovative learning. Deeper game-based learning. Early learning. Personalized learning. Project-based learning. There’s even a learning lounge and learning spaces. And let’s not forget the session I’m moderating: Next-Gen learning, featuring Jessie Woolley-Wilson of Dreambox Learning, Arthur Levine of the Woodrow Wilson National Fellowship Foundation and researcher Justin Reich of MIT’s Teaching Systems Lab. I’m determined: This session will be about education. No insider jargon will be tolerated. Okay, back to the array of happy hours with various sponsors and prefixes: Industry, Innovative, Maker, Propagate Wordnerd (seriously), Podcasting, Ed-tech Women and EdTech Austin, to name a few. There’s also a host of private parties and cocktail events. Much as I love a good Margarita — they know how to make them perfectly in Austin – I’m not so comfortable with the earnest swirl of enthusiasm for new products and programs surrounding these upbeat gatherings. I know that many of the start-up entrepreneurs throwing elaborate parties, handing out logo T-shirts and hawking the latest software to solve the achievement gap problem will simply disappear in the years ahead. That’s why my team is less interested in product pitches and predictions about who will be making money in ed tech than we are in speaking with teachers, principals and other educators who spend their days in America’s classrooms and campuses. We also love hearing from experts who dig into research and data for evidence of what works. The good news is that plenty of them will be at SXSWedu, bringing new ideas and a passion to improve teaching and learning. 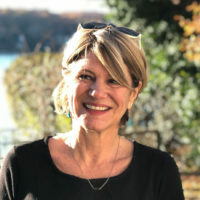 I have to hand it to the open-minded festival organizer Ron Reed and his team, who in recent years have listened to critics and made great strides in improving the quality and quantity of conversations at SXSWedu. Ron welcomes honest feedback, and got an earful when he stopped by our offices at The Hechinger Report earlier this year. We were blunt: We believe there’s an education crisis in this country, and if no one is talking about problems no one is going to bother to try to fix them. That’s why you’ll find us at the Policy Forum, listening to and/or moderating discussions ranging from Common Core standards to the presidential elections, teacher prep, college rankings and school integration. We’ll be at sessions on early childhood education and blended learning. (Plug: sign up for our blended learning newsletter). We look forward to hearing from Russlynn Ali on equity issues and revamping U.S. high schools, a topic we are obsessed with. The list of speakers and sessions is both extensive and impressive, and we can’t make it to as many as we’d like. All of this makes SXSW.edu an essential stop for anyone interested in issues that drive us at The Hechinger Report – inequality and innovation. We’ll have four writers and editors in Austin this week. We’ll be listening and learning, taking notes, tweeting, and moderating panels. We look forward to meeting new sources and finding plenty of stories worth telling. If all goes well, we’ll wear out our boots — and enjoy a margarita or two.